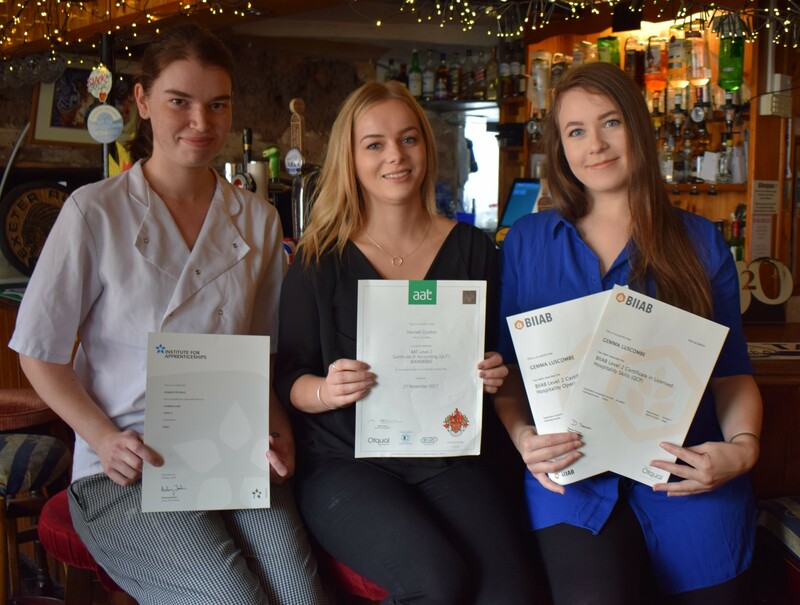 Continued investment in training is paying dividends for the Volunteer Inn in Ottery St Mary, as three staff members celebrate achieving relevant qualifications. Hannah Cureton obtained Level 2 in Accounting through the Association of Accountancy Technicians (AAT); Gemma Luscombe gained qualifications in Licensed Hospitality Skills and Licensed Hospitality Operations with BIIAB, the awarding organisation for work based learning providers and employers; and Charlotte Wills, who helps to prepare meals for the pub’s busy restaurant, qualified as Commis Chef with the Institute of Apprentices. Landlord Mike Down says that supporting his staff with training opportunities gives them a clearer career path. “Working in the pub trade is sometimes seen as stop gap for younger people, and traditionally the hospitality trade overall has a fast turnaround in staff,” he explained.